The Duke and Duchess of Cambridge are not even married two months and already speculation is rife about when they will produce an heir. Keith Vaz, Chairman of the Commons home affairs select committee said 'William and Kate have been married for over a month and the biological clock is ticking. We need change soon'. I think this is quite an unfair statement. Firstly Kate is only 29 and they are still in the honeymoon phase of their marriage. The Duchess could hardly be expected to tour Canada and the U.S. while expecting. For any young couple deciding to start a family takes careful thought and consideration, especially when your child is heir to the throne. William and Kate were slated in the press for waiting so long to get engaged with the tabloids branding Kate 'Waity Katie'. 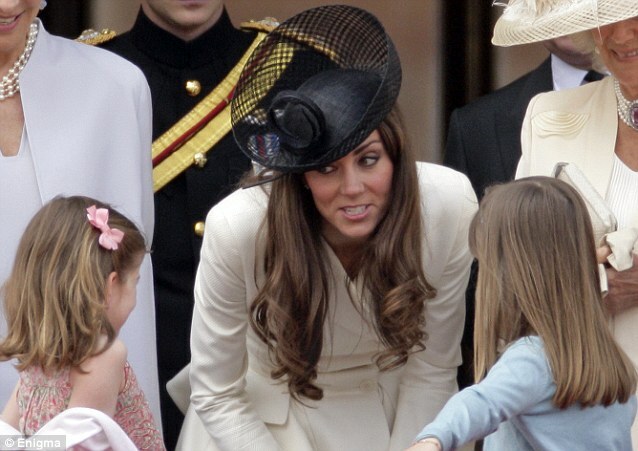 During the Trooping The Colour celebrations Kate appeared to be having a wonderful time talking with Lady Helen Taylor's children Estella and Eloise. Like William children warm to her very easily.